If anyone gets a copy, can you let us know what the article is about? 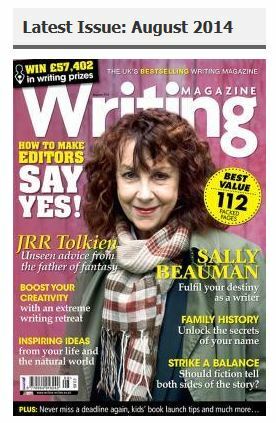 "JRR Tolkien’s honest, encouraging and practical advice...and the writer who learnt from it"
Interesting; thanks for posting Trotter. Copyright is indeed retained by the Tolkien Estate. Snippets could most likely be posted under the "Fair Use" doctrine, but anything more sizeable (such as printing an entire letter) would certainly require permission. If you look at the scan of the letter, you will see the permission granted by the Tolkien Estate on the right. Though from a magazine that deals with writing and copyright for writers, then you would expect them to get this right. I've been trying to order a copy through the site, but despite 10 or so tries, I can't get it to accept my order. After I enter my credit card info and hit the button to process the order, it returns to the cart view, and doesn't actually place the order (so far as I can tell). Had anyone else in the US successfully placed an order? I have had a few members state that they are having issues with the on-line ordering system, I have passed these issues onto the editor for them to look at. I had the same problem, trying to order the issue with Firefox browser. But it worked for me, using Chrome browser, if it can help. I ordered without any problems. Using Chrome Browser. It took two tries for us to successfully order, using Firefox on a PC. I think the first time failed because the address information didn't exactly tally with what's on file with my bank for the card, and the transaction had to go through Verified by Visa. The order form is geared toward U.K. addresses, though the site correctly detected my country as U.S.A., that is, there's no box for U.S. state but there are boxes for house name and locality, as distinct from town. I appear to have got around this by putting my state abbreviation in the "county" box. Thanks for the feedback, which I'll pass to our web team. I hope you all enjoy the magazine. Just to be sure, is anyone still having difficulty getting an order placed? I was successful in placing my order just now, so it appears the site has been fixed. I am also happy to help if people have problems ordering the magazine.